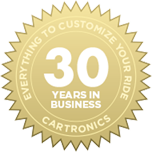 Since 1982, Cartronics has been committed to providing the highest quality product technologies and customer service in the Mobile Electronics industry, here in Nashville, TN. Our solutions-based approach allows our product specialists to listen to our customers’ needs and recommend the best products or services to surpass their expectations. We strive for 5-star service with every customer experience! Our team of MECP Certified installation technicians and fabrication specialists are among the best the industry has to offer. Our technicians are constantly training directly with product manufacturers so that we are always on the cutting edge of new car technology. From basic radio installations to full custom overhauls, Cartronics is the place to bring your car, truck, motorcycle, UTV, RV, or boat for any upgrade you can imagine.